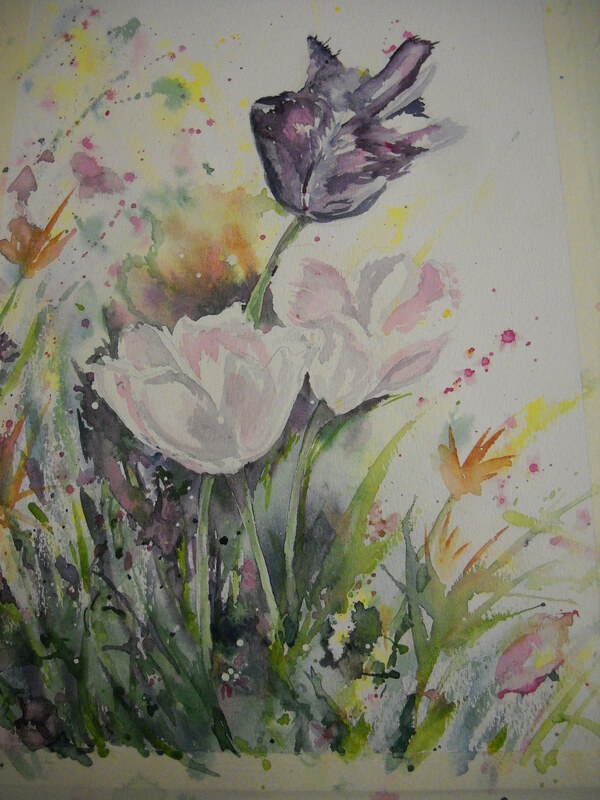 Today I worked on some tulips. I came home and bought some better paper as the surface of this one doesn’t allow me to do what I want to do. I hope this gives me the motivation to keep going. 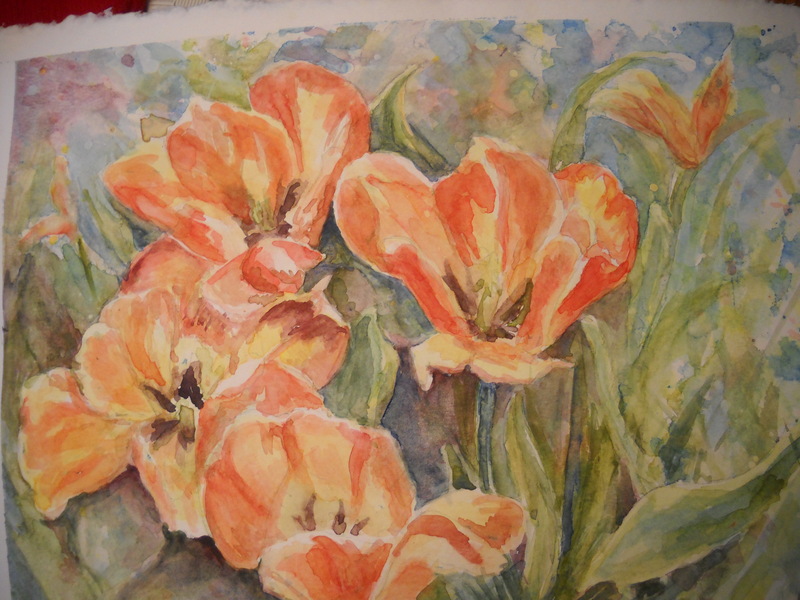 I was at Sarah’s Enchanted Cottage today taking a watercolor workshop. The lesson was based on the method used by Lian Quan Zhen . We derw our design on the paper using a picture divided into thirds. We used masking fluid to block out the flowers and then splashed on color. Once it was dry, we removed the masking fluid and and added more color. It has been quite a while since I have done watercolor and the paper wasn’t the greatest so I have a few spots that I would like to lift the color out of but it wasn’t working. Oh well…………… Here is my effort today. The color in the picture isn’t great but you get the idea. I ordered new business cards. I worked on my Etsy site but it still has nothing on it to sell yet 🙂 Had my sewing machine cleaned and have it set up and ready to go. I stopped at the park to look at the building they wanted me to paint some small murals on. My final thing of note for my summer of art project was that I signed up for a two day watercolor workshop in Holton next week. I should have some pictures next week. Still no word back on the job interviews. I finished my last class on Friday. It was interesting and I enjoyed the people I was with. I hope to have a class with them in the future. Much of my mother-in-law’s things are out of boxes now. I hope to get over there to day to help organize things that she can’t do. Jim wanted to take her down to senior citizens today but she wouldn’t go. She backed out of going to church yesterday too. I had hoped the medicine they gave her Friday night in the emergency room for pneumonia would have clicked in and got her moving. Heather and Scott brought me pizza and strawberry pie for my birthday. It was good and I was glad to see them. We are trying to work out a Father’s Day barbecue with bratwurst and hot dogs. I have been working on lists so I keep myself active and not feeling sorry for myself. I haven’t heard anything back from my job interviews so far. I started an Etsy shop but have nothing listed. I am trying to be upbeat though. I am trying to be more organized in my life so I am making lists to help support my summer of art. To do that, I am making lists of what things I want to get done and what things I hope to get done. Do a painting based on Kaleidoscope designs. Design and paint restroom in park. Finish the English Garden rug. We will see how much actually gets done. June 3rd was the cut off date, the day of no return. I am officially done with my employer. It is scary and I still feel dejected some days but am working on stepping forward. I have had two calls about a possble job in the Topeka school district but we are still playing phone tag. I am working on my summer of art project. It has mostly consisted of studying books, You Tube videos, a bit of sketching and contacting a lady in KC about some more lampworking lessons. I want to bring my skill lessons up another notch. By the end of summer vacation, I would like to be making glass buttons and some thimbles. To that end, I have ordered a thimble mandrel, some glass rods, a circle mold, fiber cloth, some kiln wash and a few other sundry items to use for that project. In the sewing department, my goal is to make some denim tote shopping bags. I have the embroidery patterns and thread. I will buy the fabric for that soon. If that goes well, I have some lace patterns I want to try and hope to sew myself some clothes as well. In the painting department, I have purchased some better watercolors and have some books checked out of the library. Mom and I plan on going to see someone she knows to take some lessons this summer. We also plan on going to the The Flying Pig to check it out. You see, I am trying to be positive and to move forward. I just finished three days of classes for my employer. I enjoy the summer classes as I always learn new techniques. It had an awkward ending though. At two o’clock, there was a retirement party for my boss and the administrators from my school were all there. I wished him well and left as soon as I could. When I got home, I had a message about calling for a job interview for a special ed job in Topeka. I was hoping it would be for the art educator job. I am nervous about going to the interview as the schools are so much bigger and I had to listen to one woman in my classes talking about hearing gun shots in the area around her school. This all just makes me tired. Being a new person, trying to make new friends, and trying to learn new procedures takes so long and the first year or two are always difficult. My mother-in-law should be moved down here by the middle of next week. I know she and Jim are both anxious to having the moving part over with. I should get the key tomorrow and hopefully can get a few groceries in there for her.